Music is a universal language that brings people, thoughts, and feelings together. That’s the idea behind the a Special Children’s Choir, a Korean-Amercan/Adoptee Children’s/Youth’s Choir in Minnesota. “Eating and music are cultural language. Through music and food, we can share our culture,” said Joshua Kim, Founder of Culture in Motion, which hosted a benefit for the Special Children’s Choir. The group invited three professional musicians, who are also Korean-American adoptees to perform a benefit concert on August 13th at Shepherd of the Hills Lutheran Church in Shoreview. “These projects are special to us, “ said pianist Kevin Kwan Loucks, one of the featured performers and a graduate of the Julliard School of Music. Kwan Loucks, an adoptee born in Korea, made his first trip back to Korea earlier this year as the Principal Artist-in-Residence of the International Arts Mentoring Program, which brings music performance and arts education to underprivileged children throughout Korea. He thought the benefit concert was a truly meaningful event. “It’s one thing to do a concert, but another to do something for a real cause, something really important and something we feel passionate about,” he said. A small group of children, the beginnings of the children’s choir, also performed a song in Korean at the concert. The hope is that someday the choir will be larger and multi-ethnic with children ages eight to eighteen. They will sing not only in Korean, but in other languages of the cultures in Minnesota. “We want it to be a multi-ethnic group and to establish through the choir a new cultural window to promote intercultural relationships,” said Kim. It’s through music that Choir Director Jin Ho Hur hopes to promote the exchange of ideas and cultural understanding. They hope the choir will perform throughout the Twin Cities and around the country. “We want to provide cultural space to connect with each other,” added Kim. The children’s choir will also give the Korean-American adoptee community an artistic outlet. Minnesota is estimated to have 15,000 Korean-American adoptee families. “I think the arts are invaluable for expressing those pre-verbal emotions adoptees feel,” said Nam Holtz, another performer at the benefit concert. Holtz is an actress, dancer, musician, and filmmaker. She connected with Culture in Motion while working on a documentary about searching for her roots in South Korea. Holtz was found as an infant in the streets of Namhae, South Korea. She lived with three foster families before being adopted by Jane and Steve Holtz in Chicago in 1976. She says performing has offered a way to express her thoughts and feelings over the years and she thinks the children’s choir could do the same for other adoptees. “I’m all for the arts bringing kids together to let them communicate something they might not be able to in a traditional way,” explained Holtz. In addition to singing and dancing at the benefit, Holtz showed portions of her documentary “Found in Korea”, which she hopes to present in a rough draft form later this year. Yujin Choi, a Korean-American Soprano, also performed at the benefit. She graduated from Ehwa Women’s University in Seoul, Korea and is a former member of the National Chorus of Korea. The fledgling chidlren’s choir, mostly Korean-American adoptees and other Asian Americans, closed the benefit with the song “Spring of Hometown” in Korean. Their proud parents filled the audience. “It’s bringing kids together to participate in something fun and exciting and then there’s the cultural part of it. it’s awesome” said Dan Boulay, father 9 year-old Lily. The Boulays say they’ve seen great personal growth in their daughter while working with the choir. 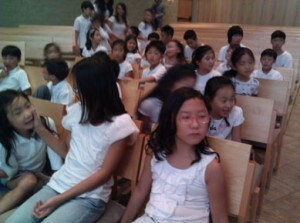 They learned of the choir through the Korean Institute, where Lily takes language classes. “She is one of the only children in the group who doesn’t speak fluent Korean, which was a challenge, but she worked hard,” added Judy Boulay, Lily’s mother. The hope is that the benefit concert will spark enthusiasm for the choir and raise some funds. The professional performers demonstrated where music can take the children in their futures. But, whether or not they become professionals, organizers and other adoptees hope the love of the arts will take them far. “We’re all here today to celebrate the kids and to make music together and share our love for music and community,” said Kwan Loucks.